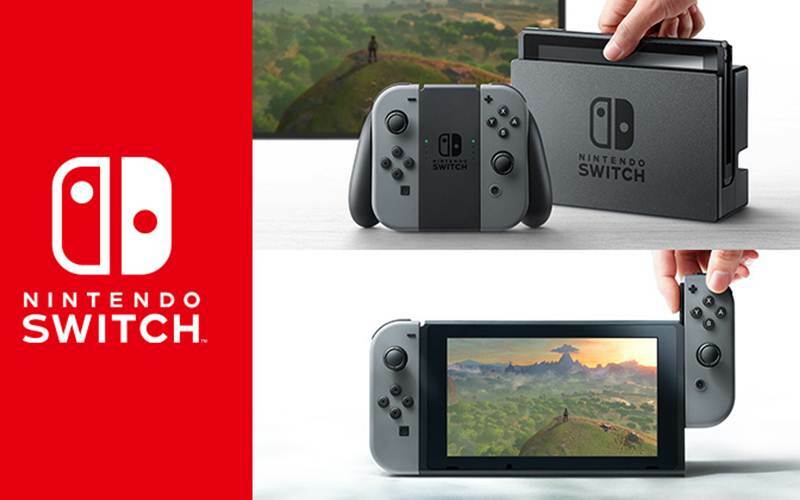 Nintendo confirmed Thursday it will launch its Switch video game console worldwide on March 3. The console, which is a combination of a home and portable device, will cost $299.99 in the U.S.
Players attach the tablet-like device to a dock to play at home on a television with standard video game controllers. Players can also remove the tablet, with a 6.2-inch screen, using a pair of “Joy-con” controllers on each side to play games while away from home. “Nintendo Switch is a brand-new kind of home gaming system that offers a wide variety of play modes,” said Nintendo President Tatsumi Kimishima in a statement. The Switch will have three game modes: A TV Mode where users plug Switch into the TV via docking station and play with a standard controller; a Tabletop Mode where the Switch sits up with a kickstand, and players hold both “Joy-con” controllers separately; and Handheld Mode, where players attach the Joy-con controllers to each side and play games on the go. The controllers will also support motion-based controls, similar to Nintendo’s hit console, the Wii. Out of the box, the Switch will include the console, left and right controllers, wrist straps, a grip to mimic a traditional video game controller, a dock, HDMI cable and AC adapter. Nintendo says battery life for the Switch will range between 2.5 to 6.5 hours. Switch will mark the debut of an online service from Nintendo similar to Xbox Live and PlayStation Network, where users can opt for a subscription to enjoy features such as online play. The Switch service will also include a free download of a Nintendo Entertainment System or Super Nintendo Entertainment System game for one month. A free trial period kicks off in March before launching in the fall. Nintendo will introduce games leveraging the controllers’ motion and sensory capabilities, including a compilation called 1-2 Switch, which features a variety of mini-games including a Western-style shootout, a sequel to the action shooter Splatoon, and boxing game Arms. Nintendo revealed the next adventure for Mario, called Super Mario Odyssey. The game will feature an open-world environment, so players can complete and explore the game in any order they choose. Nintendo says they have more than 80 games in development for the Switch, including support from third-party publishers. Nintendo also confirmed its long-awaited role playing adventure, The Legend of Zelda: Breath of the Wild, will launch along with Switch on March 3. The launch of Switch is important for Nintendo, as it seeks to rebound from poor sales of its last home device, the Wii U. Featuring a tablet-style controller, Wii U never captured the interest of consumers, falling behind to newer devices like Microsoft’s Xbox One and Sony’s PlayStation 4. To date, Nintendo has sold more than 13 million Wii U consoles.